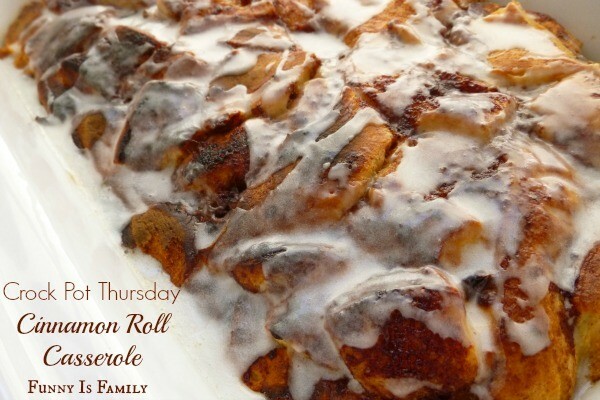 This Crockpot Cinnamon Roll Casserole is a fun and easy take on traditional cinnamon rolls! Cover bottom of slow cooker with cinnamon roll pieces, making sure entire bottom is covered. In a bowl, mix eggs, whipping cream, syrup, vanilla, cinnamon, and nutmeg until combined. Pour over cinnamon roll pieces in slow cooker. Top with remaining cinnamon roll pieces. Cover, and cook on LOW for about 2½ hours, or until casserole is no longer doughy. Top with icing, and enjoy! I used my casserole sized Crock Pot, and put the finished product under the broiler for a few minutes to get the crispy topping my husband loves!